Beachcomber Cabin is the perfect romantic getaway with beautiful views, peaceful setting and a hot tub overlooking the Strait of Juan de Fuca right off of Sequim's famous Three Crabs Road. This lovely cabin has one bedroom with a queen bed, a bath with a tub/shower combo and a loft with a queen bed for sleeping an additional two guests. The front room has an open concept living area with cozy leather sofas, wood stove, TV with Netflix, dining table that seats up to 6 guests and a fully equipped kitchen for preparing meals. Large picture windows flank the northern wall of the living area and look out on the beautiful beach and across the Strait. Enjoy a meal or a nice glass of wine on the outside patio while listening to the waves gently roll in and don't forget to take a soak in the beachside hot tub. Bring your kayak and launch right from the backyard beach and enjoy the sights of the Dungeness Spit Lighthouse and Mt. Baker in the background. From the brilliant colors of the sunrises and sunsets to the sounds of the marine life at play, the Beachcomber Cabin beckons you to sit back and relax. Located in Sequim just minutes from downtown shopping, restaurants and coffee shops as well as an easy drive to the Dungeness Spit and Olympic Game Farm, both great family venues. Easily take day trips to the Olympic National Park and enjoy hiking adventures at Hurricane Ridge, Lake Crescent, Sol Duc Hot Springs and the Hoh Rainforest as well as the western Pacific Beaches. The team is first-rate in all regards. From start to finish, the agency is wonderful. They provide quick responses to your questions and give you all that you need for an easy check-in/check out. Recommend working with this agency! 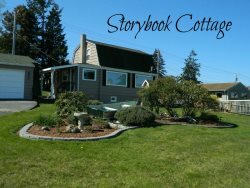 We had a wonderful week at the Beachcomber cottage. Great location, very clean and well-appointed. Quiet neighborhood. Excellent opportunity to walk the area and beach. Good weather and fun adventures. Carolyn was well-organized for our check-in and made sure that we were well versed in what to expect and how to get started. The Brigadoon staff was responsive to my inquiry and subsequent questions once we booked. They are located right in Sequim and were readily available for check in and check out. Everything was in working order and clean. Beach Comber was ideal for the two of us. Quiet with terrific views of Komo Kulshan and great fun to watch the fishing boats and "salties" coming and going. And more, the wood heat was an added benefit. After a day in the mountains or on the spit, it was great to have the fire to come home to. Very friendly and accommodating office staff. Staying at Beachcomber Cabin was everything we hoped it would be and more. Sitting outside on the patio with the breeze off the water was by far the best feature. It was very relaxing and peaceful. It was the perfect house, just what we were looking for. Check in time is 4 PM and check out time is by 11 AM.